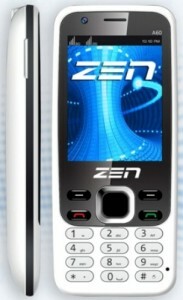 Zen A60 features 2.4" colour display with 3G Support and has a storage of 78MB which can be expanded further upto 16GB. It sports a 3.2 Megapixel rear camera with a VGA front camera. Other options of A60 includes Bluetooth, GPRS/WAP, Social networking possible, USB, 3.5mm Audio jack, FM Radio, Multi-format Video/Audio Player, JAVA enabled, Gtalk, Twitter, Facebook and Skype apps. The Zen A60 comes with a price tag of INR 3100 Rs. This Dual SIM mobile phone has Dual Standby support. Tag: Dual Sim mobile phones India, Zen A60, Zen Dual Sim Mobile Phones, Zen A60, Zen A60 features, Zen A60 specifications, Zen A60 review, Zen A60 details, Zen A60 availability, Zen A60 specs, Zen A60 images, Zen A60 pics, Zen A60 pictures, Zen A60 imgs, Zen A60 Network options, Zen A60 Expansion options, Zen A60 multimedia features, Zen A60 price.